Don’t die each day worrying about solving all the problems you have and fearing you have very little time left for you to live! Remember: there was a world before you and there will be one after you are gone. One of the favorite obsessions we have is to worry. We worry not only about the day-to-day challenges that confront us but agonize over everything that’s wrong with the world! We worry about our finances, our relationships, our health, our lives; even as we worry about the way our communities think, our neighbors behave and the way our countries are governed. 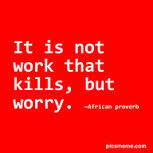 Worrying kills us faster than we think it does. In fact, we die a small death, each time we worry. Because that time could have been spent wisely__LIVING. And there are only two ways to LIVE without worrying: 1. Accept your Life and your world for what it is and/or 2. Take immediate action to remedy the situation that’s worrying you. It is when we do neither that we die. And, believe me, the tragedy is that most of us are subconsciously worrying all day, each day of our Life. Over a period of time, this subconscious mental activity has become an integral part of us. Years of worrying have created an imaginary belief in us that without us, the world, at least our world, will come to a standstill. That’s when we must twiddle our toes to remind ourselves that the ‘I’ within each of us is powerless. Imagine, you think of twiddling your toes. And your toes twiddle. How did the instruction get transmitted in a nano-second from your CPU, your head, to the event-site, your feet? And if you think YOU managed that, think again. 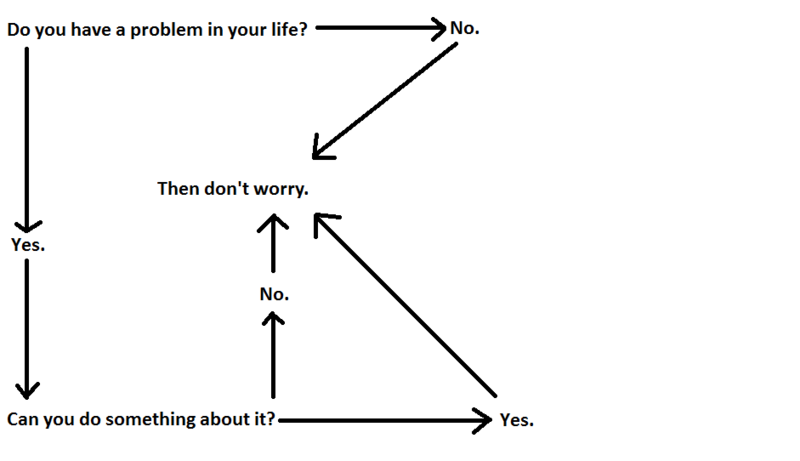 So, quit worrying. Only then will you stop dying – and start living! Enjoy the scenery as you travel instead of agonizing over the seat not reclining or the arm rest not being comfortable on this amazing once-in-a-lifetime bus ride called Life!